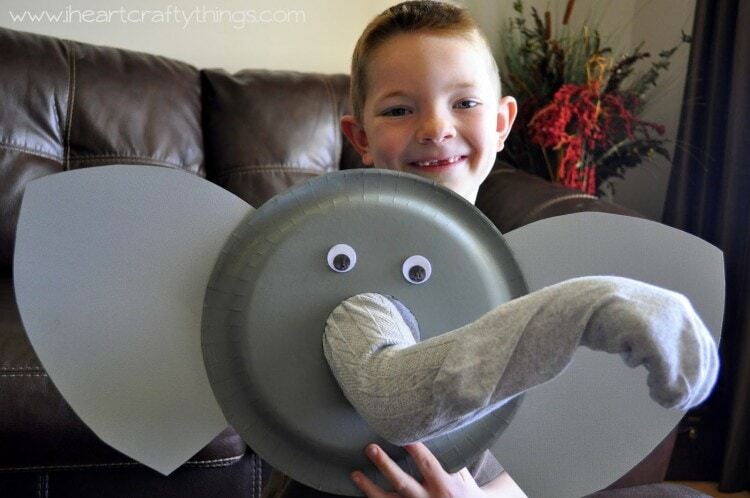 A couple months ago I shared this Paper Plate Elephant Puppet craft over at Brassy Apple. I wanted to share the tutorial with my readers here in case you missed it over there. 1. 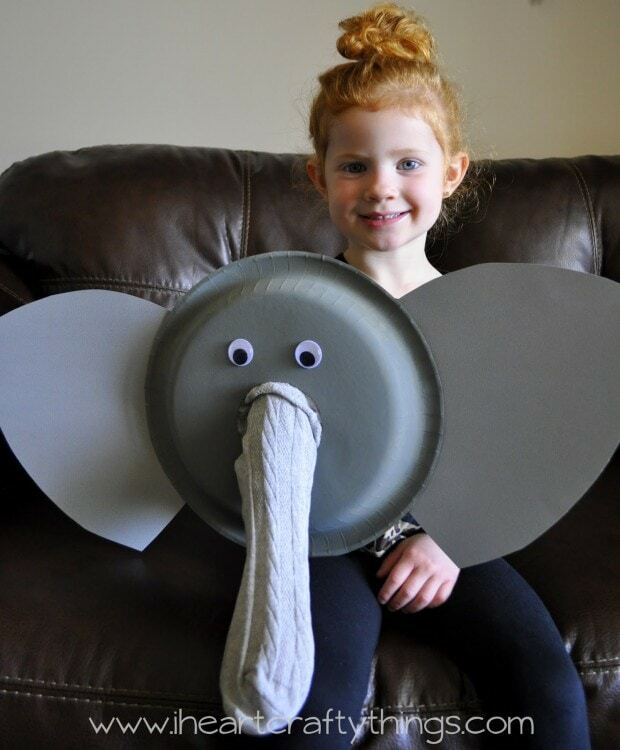 Start by using a pencil to trace a cup on the back side of the paper plate where you want the elephant trunk to be. Use a craft knife to cut the circle out. Now paint the back side of the paper plate with gray paint and let it dry completely. 2. 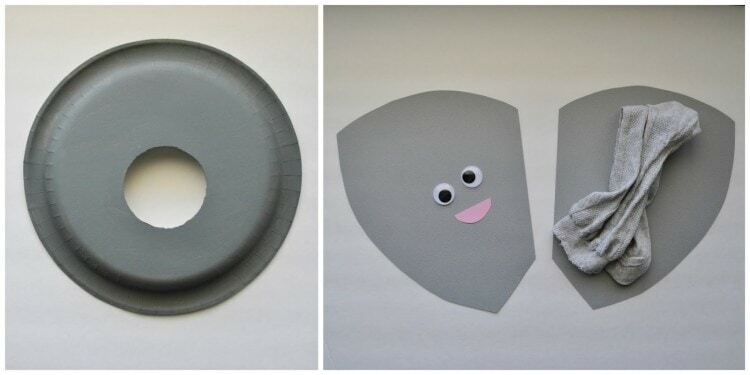 Cut elephant ears out your gray cardstock paper and set them aside. You will also need to cut a small mouth out of your pink paper. 3. 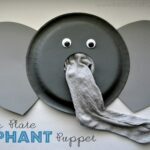 Once your paper is finished drying, you need to glue the gray sock to the paper plate to make the trunk a puppet. I started by stretching out the top of the sock as much as I could to help it stay down better when gluing. 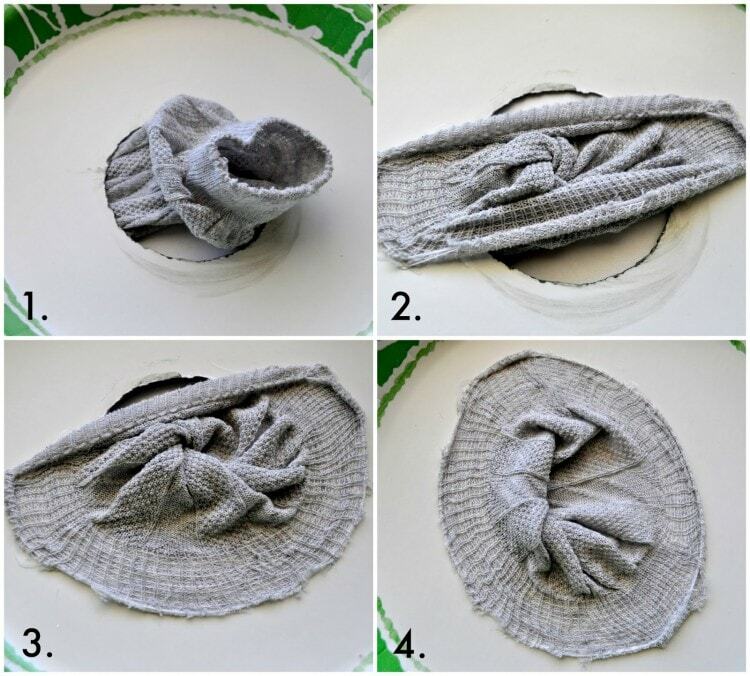 (Use the images below for a guide) Pull the sock through the top of the plate. 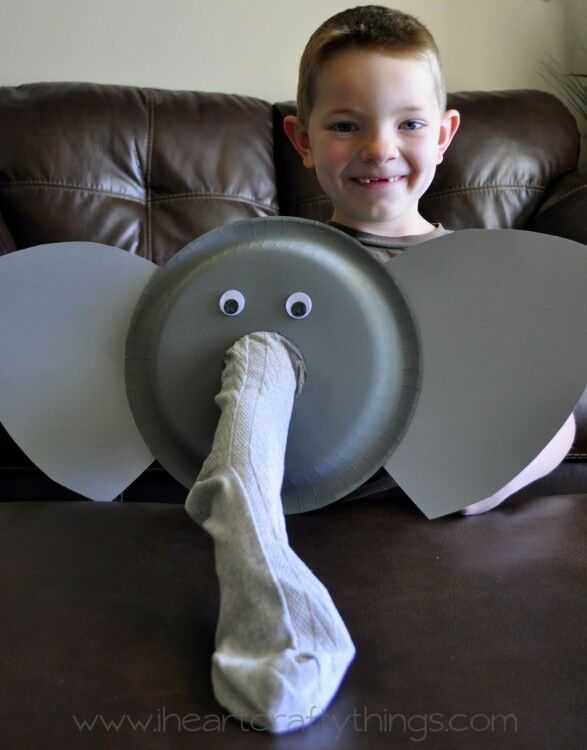 Put a dab of hot glue on one section of the plate and fold the sock over and glue it down. Put a dab on the complete opposite end of the plate and fold the sock over and glue it down. (See #2 below). Now glue small sections at a time all the way around the sock until it is all glued down around the plate. 4. 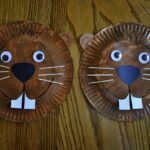 Turn the paper plate over and glue on the ears, googly eyes, and mouth. You can use school glue for this part, but if you are inpatient like us, you can use hot glue to put the pieces on so you don’t have to wait for it to dry. Now it’s time to play! 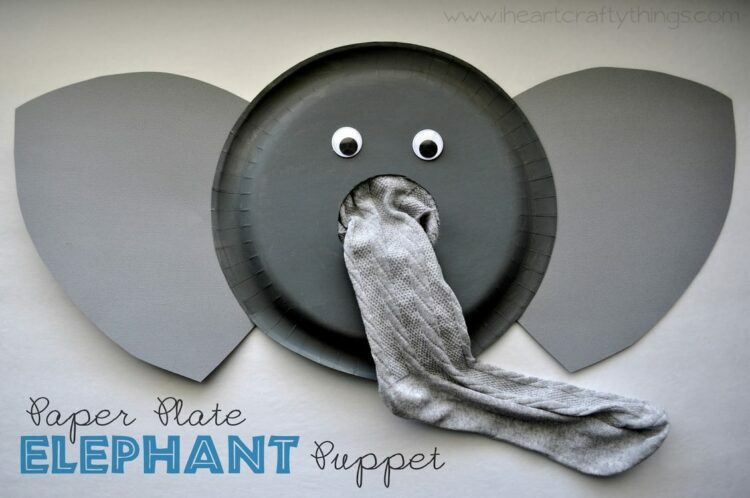 Just put your arm in the sock hole in the back of the paper plate and you have an elephant truck! You’ll have lots of giggles, laughter and tons of fun!! 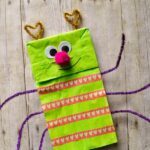 There are so many different books you can use to go along with this craft. 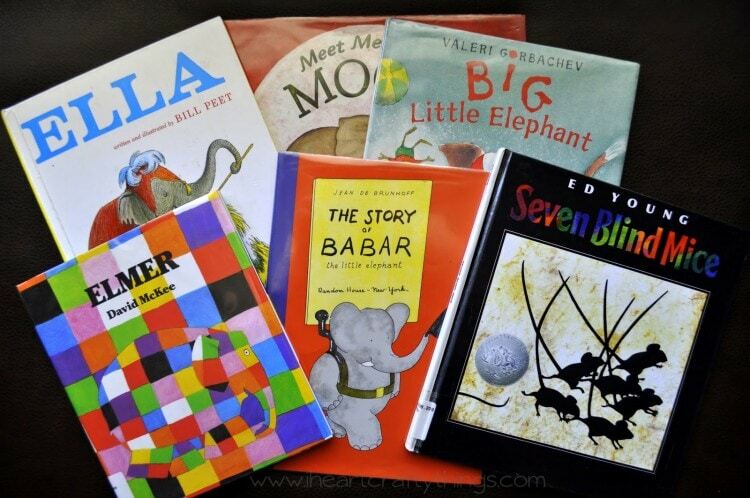 Here is a picture of several we picked up at the library when we made this craft.